“You can eat for two now!” … hmmm not quite. This is a huge, common response when you announce you are pregnant. It’s like it is used as an excuse to eat whatever you want and how much of that you want. Don’t get me wrong, I love a good treat, and have definitely been treating myself a lot more than I usually would when it comes to food. But, the whole “eating for two” is a myth. 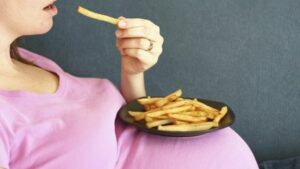 Any you may be shocked to find out how many calories it is that you actually need extra whilst growing a baby. The Guardian states that around 15-20% of pregnant women now are overweight or obese. Talking to my mum or grandparents about pregnancy almost turns into a battle of different beliefs. It’s like you can’t mention that you had a work out in the gym to them without their jaw dropping to the floor and you get a lecture about how you should be taking it easy. I even find myself telling them that I only went on a light walk, when really I was squatting my near enough my own body weight on my back as a warm up. When it comes to diet, they have a strong belief that you should be eating for two. I mean, my baby is currently the size of an avocado. Why would it need a full portion of food? 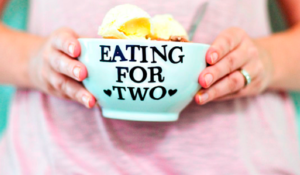 According to the NHS, there is no need to eat for two during pregnancy, even if you are expecting twins or triplets. The original idea behind eating for two was to increase your energy. During the first 6 months of your pregnancy you do not even need to only drink full fat milk, another common myth. Only in the last 3 months of pregnancy do you need to increase your calories by 200 a day. When you work it out, that isn’t actually a whole lot extra. Most people consume more calories a day than recommended too, without adding in the extra. It is recommended that you should do at least 30 minutes of moderate exercise a day. Swimming and walking are a great way to keep fit. If you already are a physically active person like me, you will have more of an idea on how to tone your workouts down. Obviously it isn’t advised that if you have never been inside a gym before to start now and complete a huge workout. You should start off with no more than three 15 minute workouts a week. One whole year with my baby Mole is approaching fast! 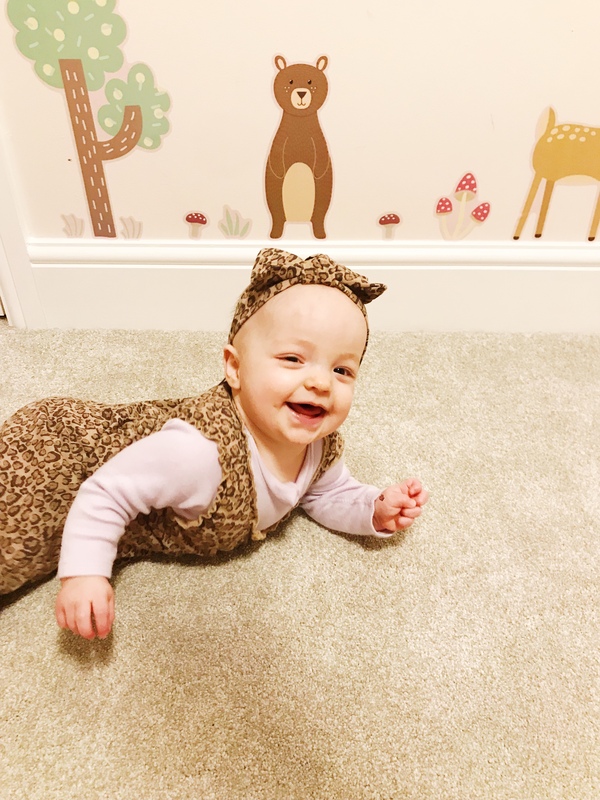 I thought it will be nice for you for me to do a little recap of her personality so far…. One whole year with my baby Mole is approaching fast! I thought it will be nice for you for me to do a little recap of her personality so far. I feel like I say this every single time but, as time goes on I just have so much fun. Each day gets better and better! 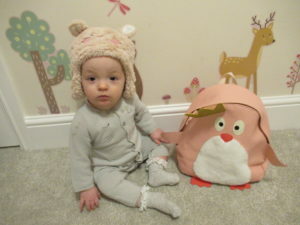 Mole attends nursery 2 consecutive days a week. Me and Jay both decided it will really benefit her social skills to be around other babies for a full day. At nursery she has also learnt to eat finger food to the point now where she refuses puréed food. This has been a huge advantage as it’s been cheaper and easier to get her a healthy meal. It’s even fun ordering off the menu for her when we dine out. 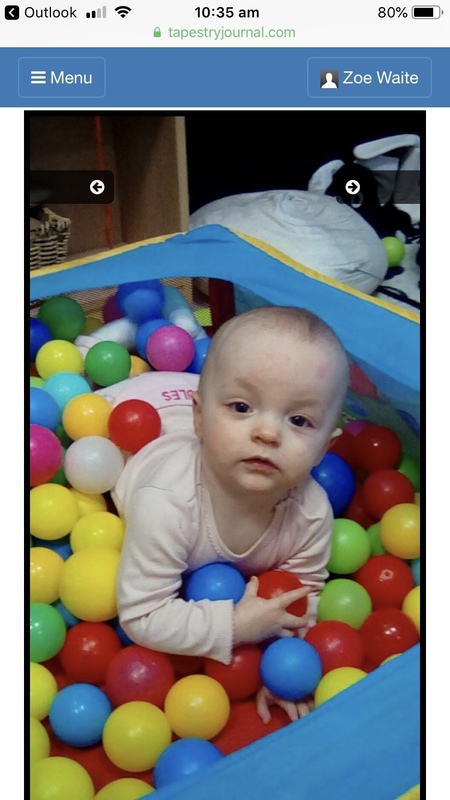 Nursery send me daily updates with pictures of what she gets up too and how each activity she does helps her development. Moles favourite food now is pancakes, cheese crisps and anything else cheese related haha. I still work on her eating her vegetables but when they are mixed into a pasta dish or cottage pie she’s great with them. 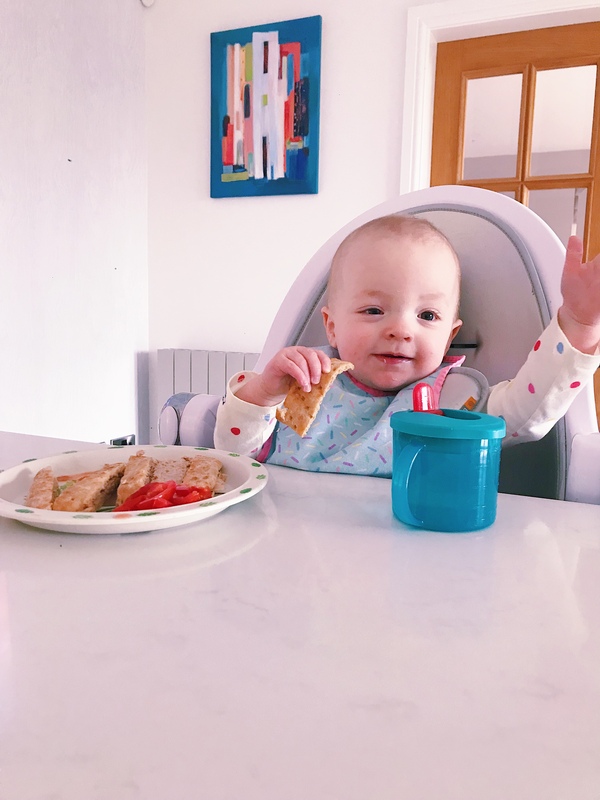 I get most of my food inspiration for her off BLW Instagram accounts, or I give her a little bit of my meal. Ella’s kitchen do a handy range of frozen meals which are perfect for a quick meal. Mole drinks water with her meals out of a regular Tommy Tippe cup. Nursery stick to the same brand and type of cup which has made her consistent with her water intake. Currently Mole can not take steps unassisted but I’m sure she will soon. She loves to walk around the room as long as she’s holding onto something. Mole can say a couple of words like “mama” and “dada”. I’m really trying to help her say “hello” as she loves to wave. Mole has the best sense of humour. She loves to play peek a boo with the curtains and blankets. 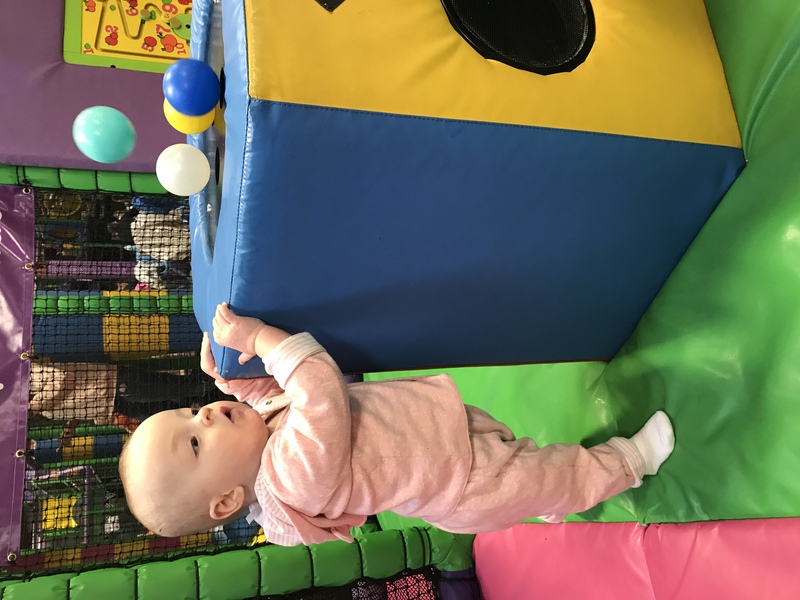 Her favourite places to visit are soft play centres, especially when there is a huge ball pool. She doesn’t like going to restaurants and gets very irritated when she’s in the high chair. It can be a little embarrassing sometimes as she will throw a huge tantrum and throw her food everywhere. We are finding a balance of going to places where we can enjoy a meal out and she has somewhere to play afterwards. If not then we just put some fun videos on our phones for her to watch. Mole goes to sleep for 6:30pm every single night. 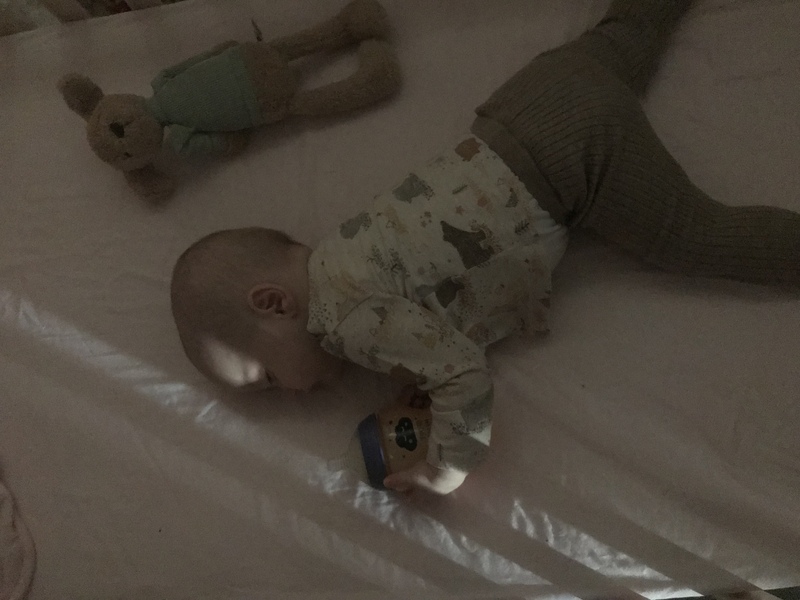 She sleeps all the way through but, I always leave a bottle in her cot in case she gets hunger and wants a feed. 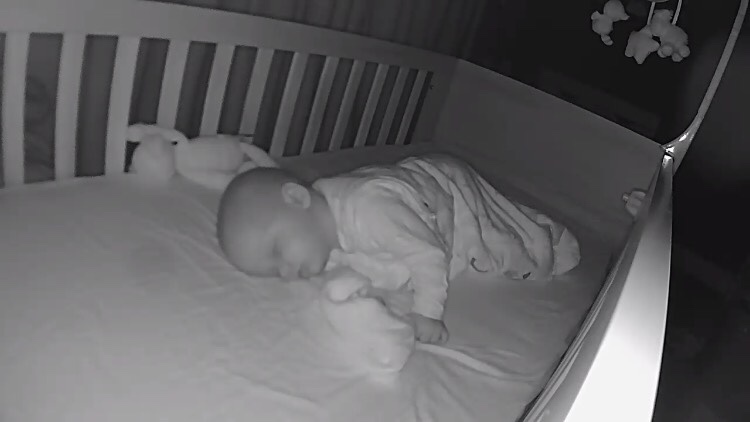 If that’s the case, she feeds herself and launches the empty bottle out of the cot and goes back to sleep. She wakes up from 7:30am. Her current favourite toys are the ball pit, books and a shape sorter. For her birthday I have purchased completely different toys I would usually go for to see how she gets on. 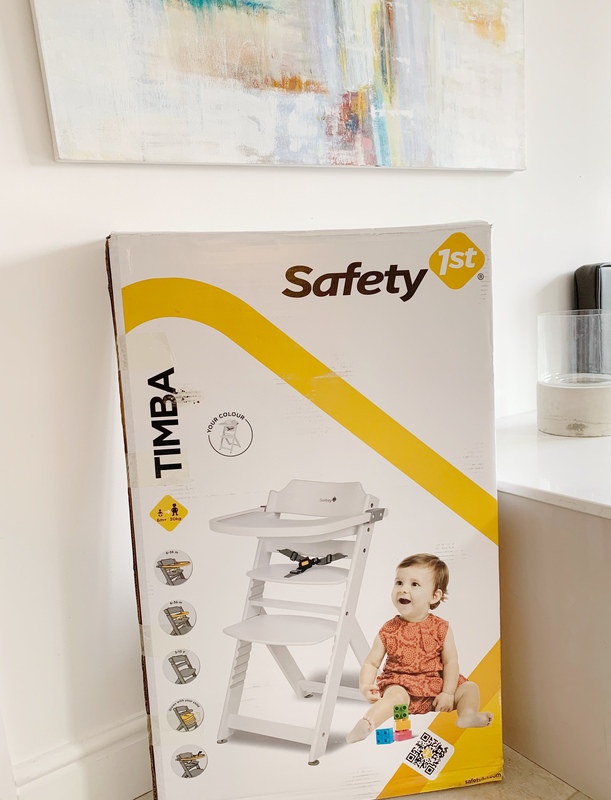 We were kindly gifted the Safety 1st Timba Wooden Highchair for a review. Even though this product was gifted, I want to stress that I still have given my honest opinion. The Highchair arrived in a large cardboard box. For some this may not be a concern but as we only have a small household bin that gets collected every 2 weeks, the advantaging of having recyclable packaging is a huge bonus for us! All of the parts inside were individually wrapped to avoid damage. There were a few more pieces to put together than I first expected but what is new with flat pack items. I had Jay to help me assemble the Highchair but, I could have done it on my own. It was just easier with him whilst I could film the process. 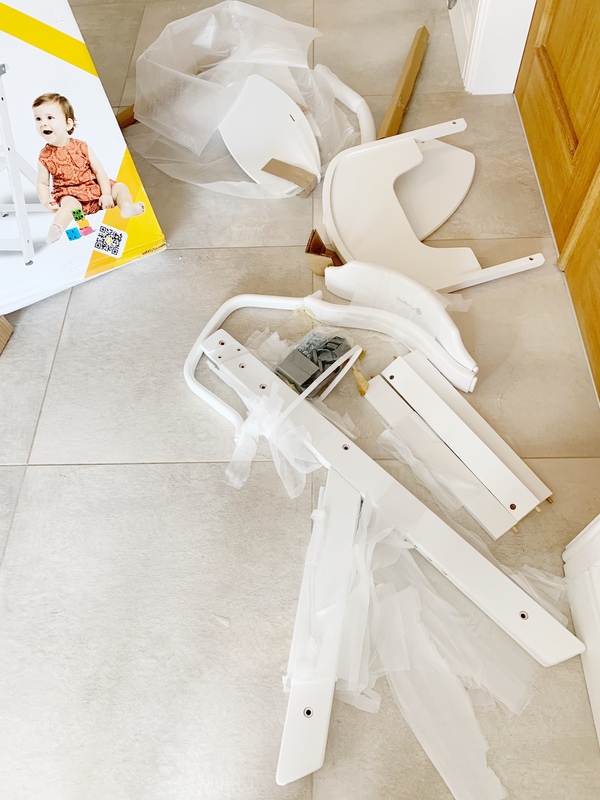 The Highchair took around 20-30 minutes to build as we came across a problem trying to slot the seat in. This meant we had to unscrew half of the chair to slot it in and put it back together again. I thought I would be honest in including that part as I know flat packed products are not for everyone. Luckily no extra tools were needed and the Highchair came with its on Allen Key. Above I have taken the features directly off the website. 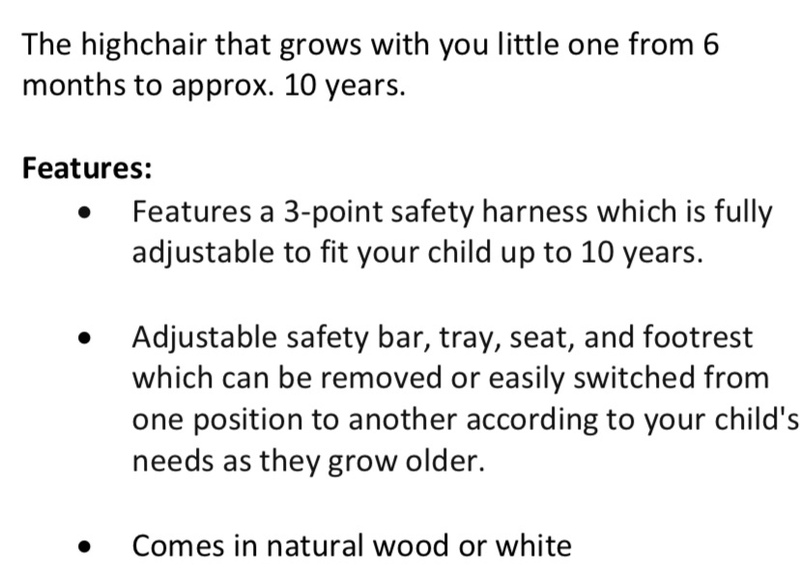 My favourite part is that the Highchair is adjustable for the size of your child. The Highchair we had previous to this one, was too big to attach the eating tray too, which meant Mole had to be against our kitchen counter to eat. 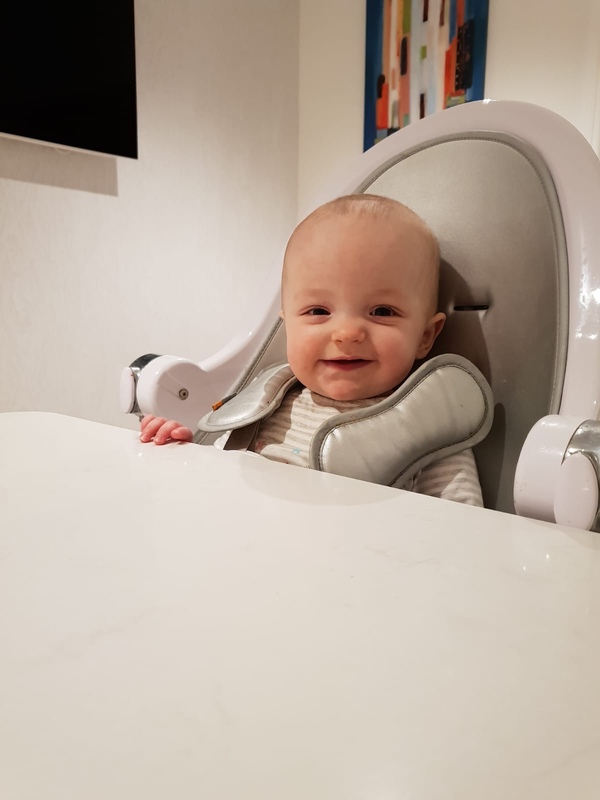 I love how this Highchair feels is it build custom made to her size and she can have her own little tray. The white shade matches perfectly with our kitchen and looks clean and modern in our photographs. 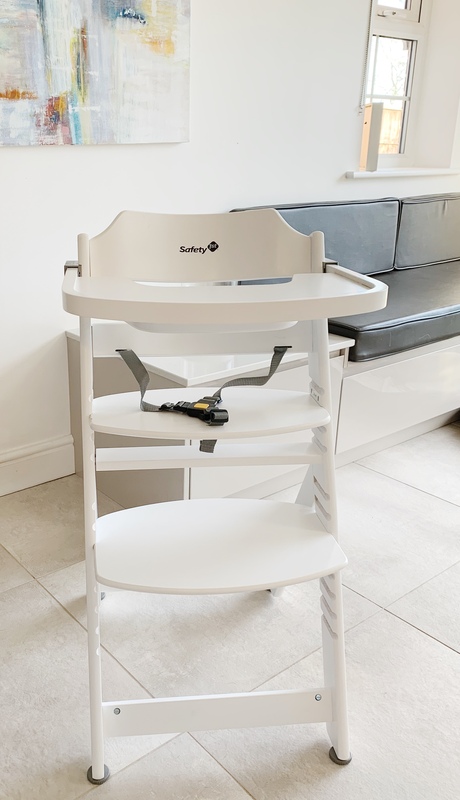 The Highchair retails at £70.00. Do I think it is worth the money? I would have liked it to have been a tiny bit easier to put together but for a wooden chair that is custom to her size I can’t complain. Our previous Highchair retailed at £450 and I can see clear advantages in the Safety 1st in comparison. 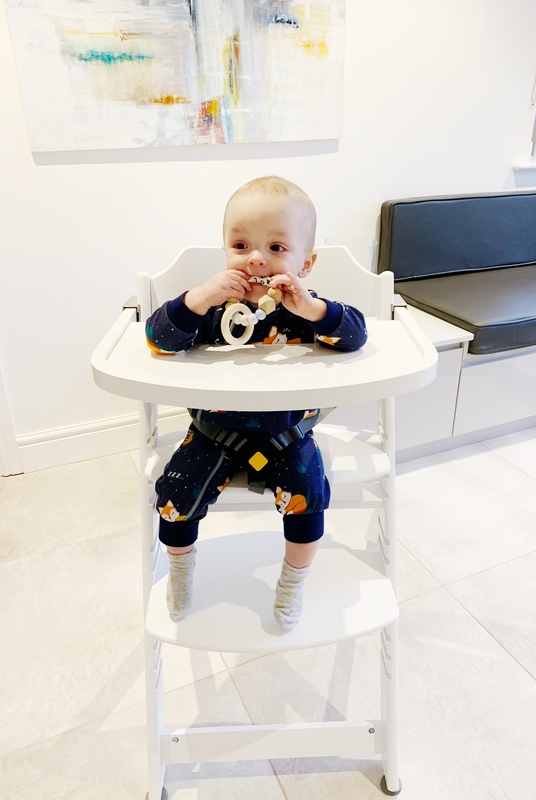 If you’re looking for a modern Highchair that looks sleek in your kitchen and blends in with the rest of the furniture (nothing bright and colourful) this is a great purchase. My favourite part is how I can update the seating size for her until she is 10 years old so I won’t have to purchase another one as she grows out of it. Mole looks super comfortable sitting in the chair and eating her food. There is also an option to purchase a cushion for extra comfort. Another factor for me is the chair is wipeable. Cleaning it down after eating took less that 2 minutes . When I was looking for a local nursery for Mole, I felt like I really didn’t have a clue on where to start. 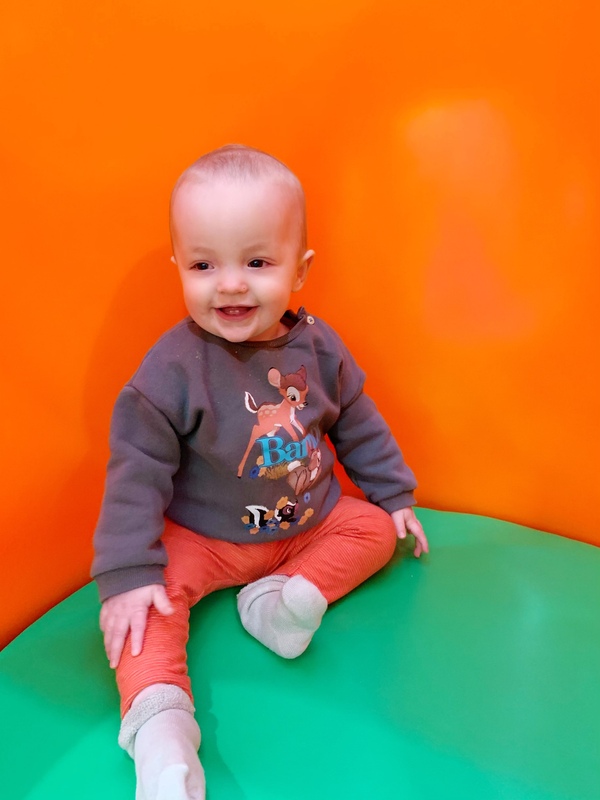 My main concern was the location but then I really got thinking, how can I be confident that the chosen place provides the best quality care for my child? 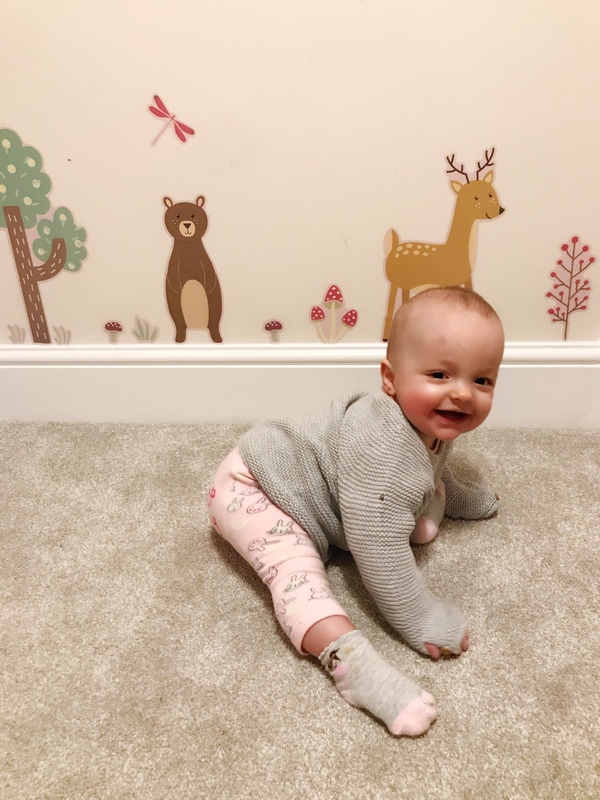 The following questions will help you put your trust in the chosen place of childcare and for me, they really helped me decide which place was best for her. Nurseries fees can vary so make sure you ask to find out what they are. Do all of your staff have a DBS check? 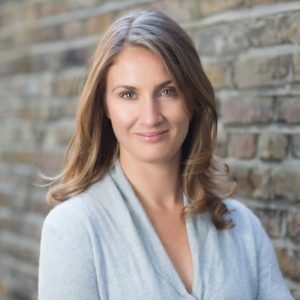 The DBS enables nurseries to make safer recruitment decisions by identifying candidates who may be unsuitable for certain work, especially involving children and provides wider access to criminal record information through its disclosure service for the UK. All staff should have had a DBS check. What are your staff to children ratios? As a teacher this was a very important question to me. I understand how important it is to stick to the correct ratio to provide the up most best duty of care. 3 year olds + 1:13 where a person with Qualified Teacher status, Early Years Professional status or Early Years Teacher status is working directly with children or 1:8 where they are not. What experience and qualifications do your staff have? At least half of the staff must hold a full relevant level 2 qualification where as the manager must hold a full level 3 qualification. All staff must have a paediatric first aid certificate and undertake regular staff training. How can you ensure safety? Nurseries must carry out regular risk assessments. That is for whether it is outside or inside. The staff must also record any medication used and inform parents/carers and record accidents. What is a key person? And will my child have one? Every child will have a key person. They help to build a trusting relationship with you both and your child. They will care to all your baby’s needs. Will my child learn anything whilst at nursery? Nurseries are required to deliver the Early Years Foundation Stage. They will provide activities that are based on your Childs interests and that help them to progress in their development. I have noticed a huge improvement in Mole since she has started nursery. Most of all I feel she has made huge improvements with socialising. What activities do they do? Nurseries should provide a range of activities including time out in the community. Mole’s nursery has an onsite farm where they will visit. Other activities can range from painting, messy play and sand box play. Do you keep parents informed of any progress? 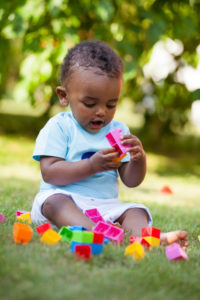 Observations are carried out to assess the progress of your child, especially at ages 2-3. Mole’s nursery keeps an online record daily of her observations and they identify what levels she is at. 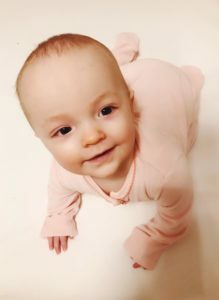 This was a big decision factor for us as I felt they really cared for her progress considering she is only 10 months old. What type of meals and snacks will your provide? They will stick to your dietary requirement. For a full day Mole has 2 snacks and 2 meals. All the meals are cooked on site with good hygiene standards. The nursery provided us with a full menu of food and we could see that they are high in vegetables. The diet can also be in a puree form or BLW style. Just let the nursery know which you prefer. All nurseries will stick to a behaviour policy and this can be different depending on the nursery. You can ask the nursery for their behaviour policy or find it online on their website. They should be using positive reinforcement and never threaten a child. Is there a set routine? Find out if they follow a daily set routine. You can also ask them to fit in with your home routine such as nap times. I hope these questions help you to feel more confident when approaching the nurseries and making your decision. The decision of sending your baby to nursery is not an easy one but doing your research first will help you feel a little more at ease. Chicken is an excellent source of protein for your baby. Babies also tend to love the mild taste of chicken combined with the sweet tasting root vegetables we will use in this recipe. Root vegetables are great to use as they give you a natural creamy texture. Moles Chicken and Vegetable Mash is high in beta-carotene, potassium and B vitamins including Folate. 75g chicken breast fillets, cut into chunks. Warm the oil in the pan, add the carrots and parsnips, sauté until softened for about 7 minutes. Add the chicken and sauté. Keep turning. Add the potatoes and cover with boiling water. Cover for around 15 minutes or until everything is fully cooked and softened. Double check chicken is fully cooked. Blend to a purée or leave for older babies. I like to use a masher so it is a textured purée. Let me know your little ones favourite meal! 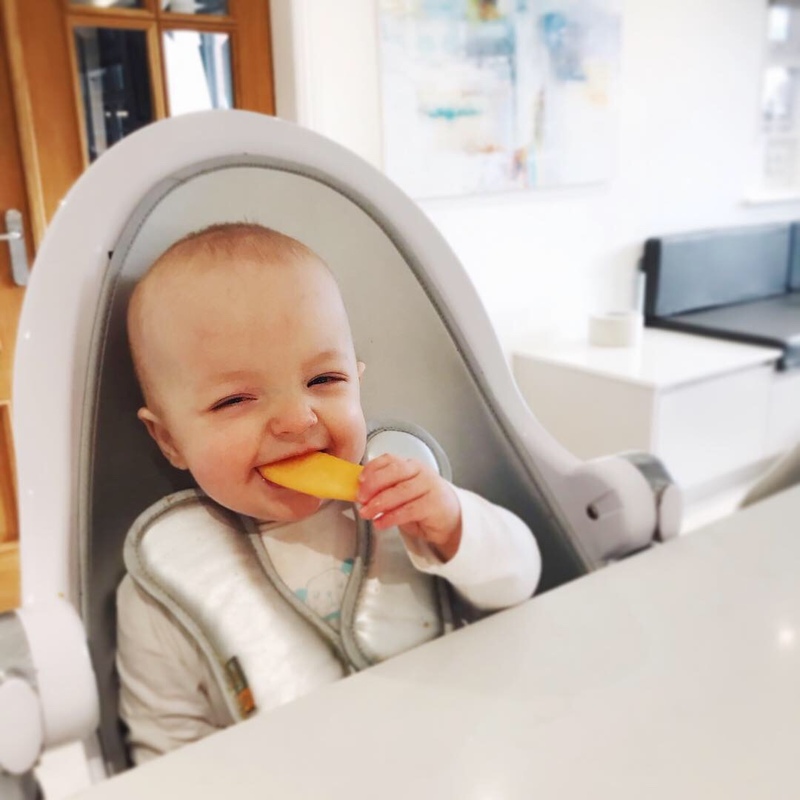 Introducing Solids With Sophie, in-house paediatrician and Co-Founder at Little Tummy’s. I was lucky enough to get the opportunity to ask and gain advice on weaning. I feel that there is so much contradicting advice out there, it can be really difficult to know what is right, when in fact you can do a lot right, and not that much can be wrong. You may be in the same position as me where it was nice to feel reassured in everything that you have been doing right so far. Here are my questions to Sophie and her responses! My baby makes a scrunched up expression on her face like she is not enjoying her food? It can take up to 10 to 15 times before a baby can like certain tastes. Especially vegetables. Vegetables are bitter unlike fruit and your baby’s sweet tasting milk. This unusual taste will be ever so strong for them when they first try it. 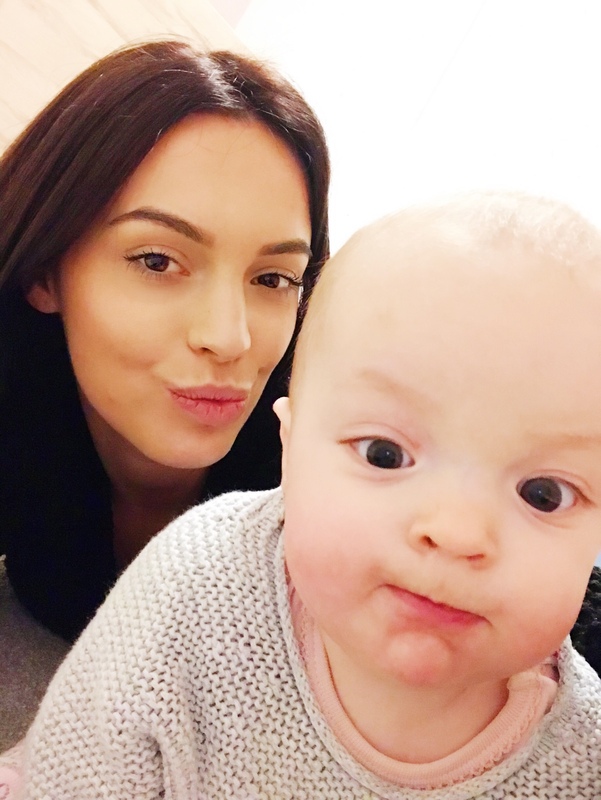 Scrunching up their face does not necessarily mean that your baby has taken a dislike to the taste, it could just be like us when we try sour food. The taste can be strong or unusual to them and that is their reaction. How can I get my baby to try more finger foods? Start off by mashing up your own family meals first. This will allow them to try different textures and help them become use to chewing first if they struggle to consume solid finger foods. How much sugar should my baby be consuming? Your baby should have 5g/100g of sugar and no additive sugar. Since watching Moles sugar intake, she has been sleeping through the night much better. Fruit purees will be higher in sugar content. When the fruit is boiled, it sets the fruit sugar free. You can make tasty lentil burgers for your baby to try. Then can be sweet and savoury, easy to chew and contain a high amount of protein and iron. My baby does not seem too hungry during the day? When your baby goes through a development spurt or a mental leap, they can forget to eat. 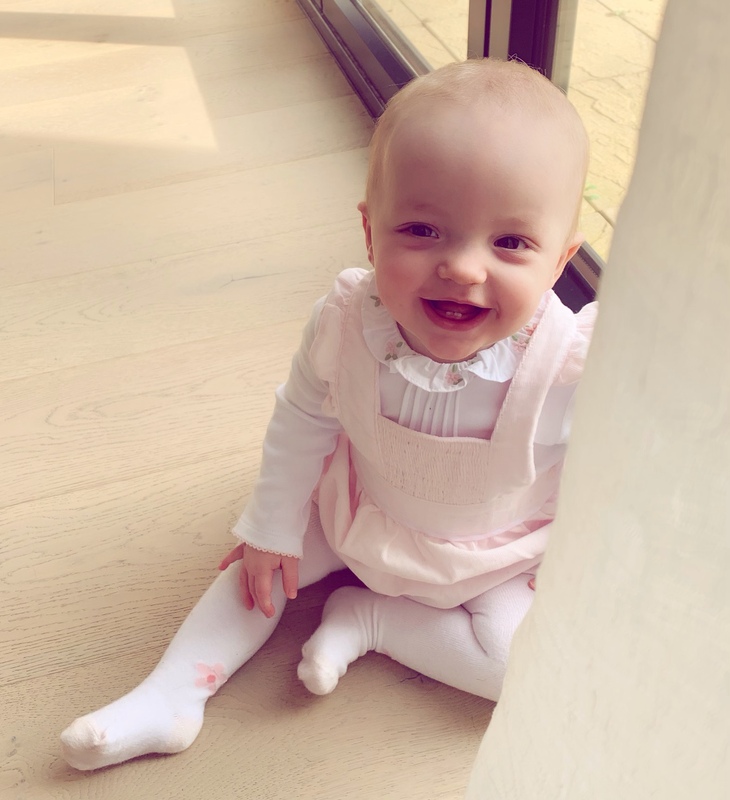 By this I mean, your baby is far too fascinated with everything new, playing with their toys, learning to crawl and explore and even trying to climb. 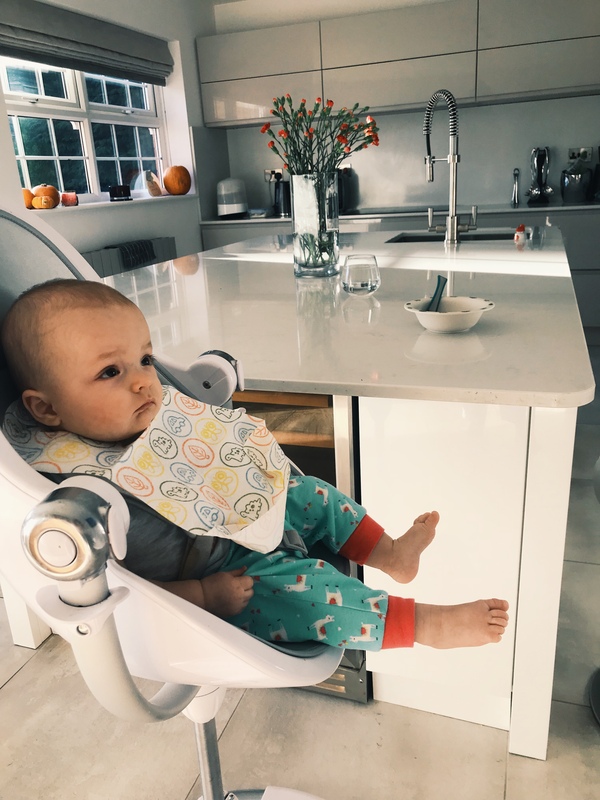 The last thing your baby will think is how hungry they are or when they are being fed, you may find they become bored quickly and want to be out of their high chair exploring. Mole would have very little appetite during the day and then be up through out the night screaming for night feeds. I changed her eating routine to make sure she had 3 meals a day and 2 snacks. I switched her breakfast to fruity, wholegrain porridge rather than natural yoghurt so she was full. Again with her dinner, I give her cottage pie and for her tea she will have something like beef strew with a dessert. Meals that will really fill her up. Her favourite snacks are Ellas melty puffs or a natural yoghurt. How much protein should my baby have? 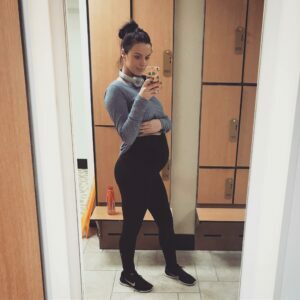 How much fat should my baby have? Is my baby getting enough vitamins? 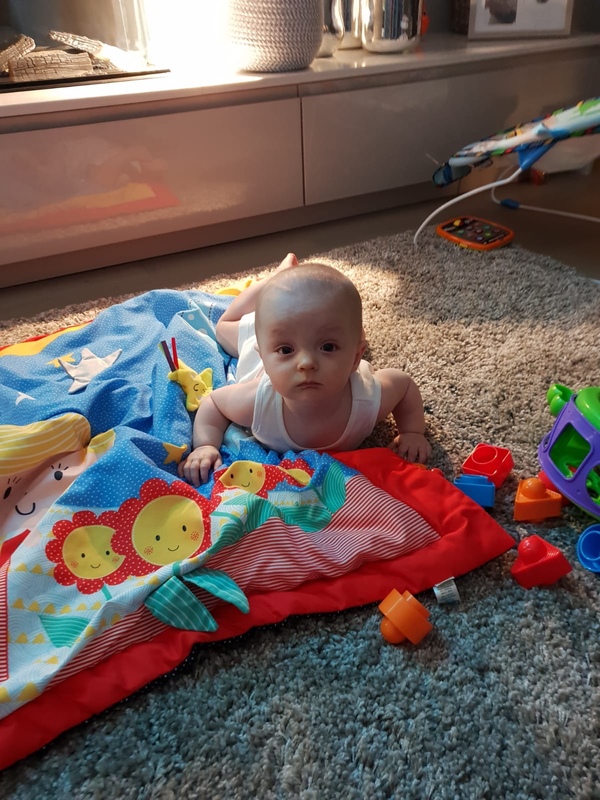 If your baby is on less than 500ml of formula then they need Vitamin D. The UK recommendation is that children up until the age of 4 years old need to take Vitamin D. The reason? In the UK we are not exposed to enough sun. Foods that are high in Vitamin D are salmon and eggs. Although you will need to eat 10 eggs. You can read mine and Mole’s Vitamin routine here. 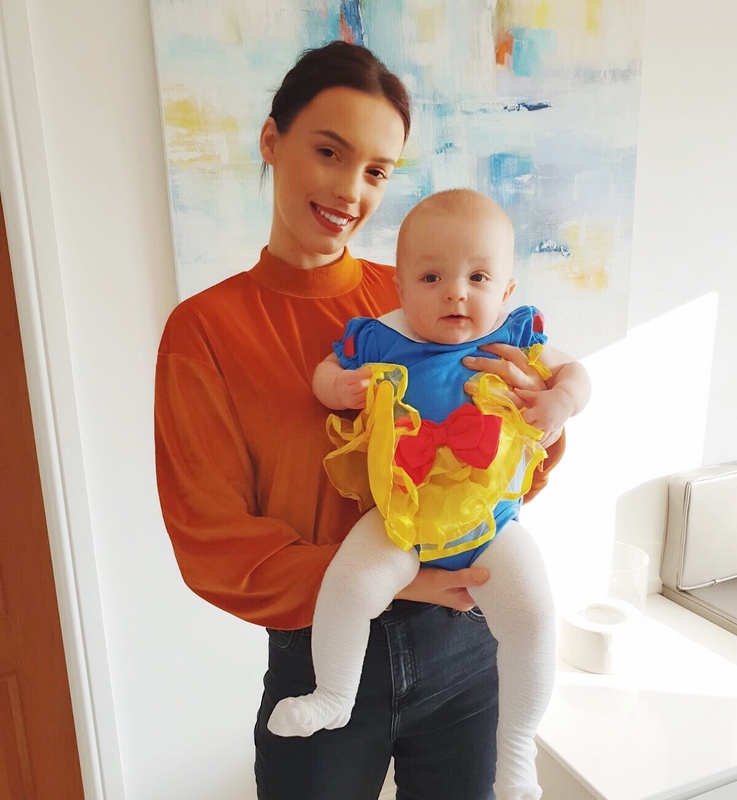 My baby is starting nursery, any tips on staying healthy? With nursery comes viruses and infections. It unfortunately is something that your baby has to go through but will help strengthen their immune system. Winter will be worse as they are inside, the air from the heating will be dry and the babies will be touching each other. Make sure you and your baby are getting enough sleep, Vitamin D, iron and zinc. Again this can be found in fish, lentils and beans. 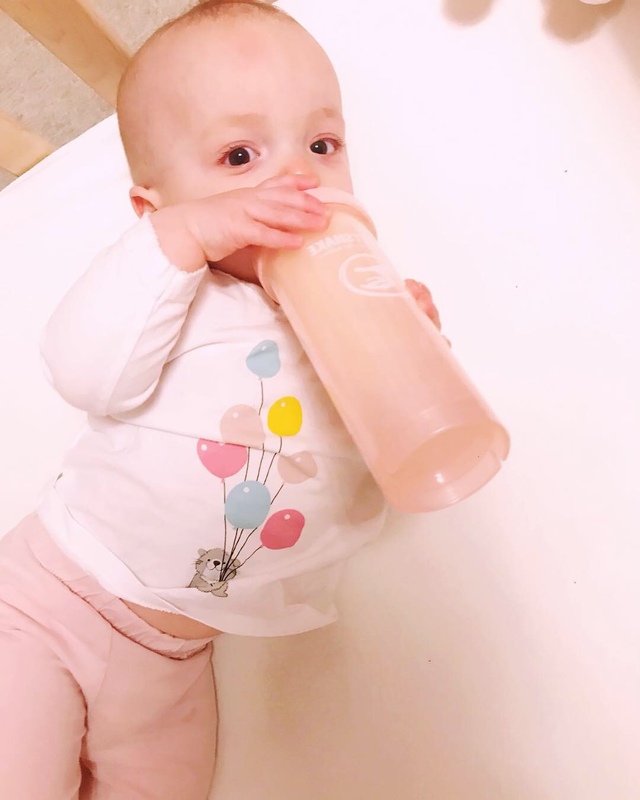 How can I get my baby to drink water from a sippy cup? Some babies prefer to use a straw with their cup. The main tip is to be persistent and keep offering the sippy cup. If you supervise your baby, offer them a plastic or glass cup and see if they prefer that method instead. I hope you have learnt something from my questions, I sure did! Remember…there is so much that you will already be doing right! A massive thank you to Sophie at Little Tummy! I am going to share my secret in achieving silky legs with Friction Free Shaving. I wear fake tan. I’m constantly in a battle with dry patches on my skin where my fake tan clings to it and leaves speckled brown dots on my legs. Previously, I always used one bladed Bic razors. They are cheap and easy to pick up from the high street shops. But, every time it came to shaving I would dread it! I would be left with multiple shaving cuts and my skin would still be rough. I teamed up with Friction Free Shaving and thought well I might as well give it a go and see if it really is Friction Free. Easier than the high street? 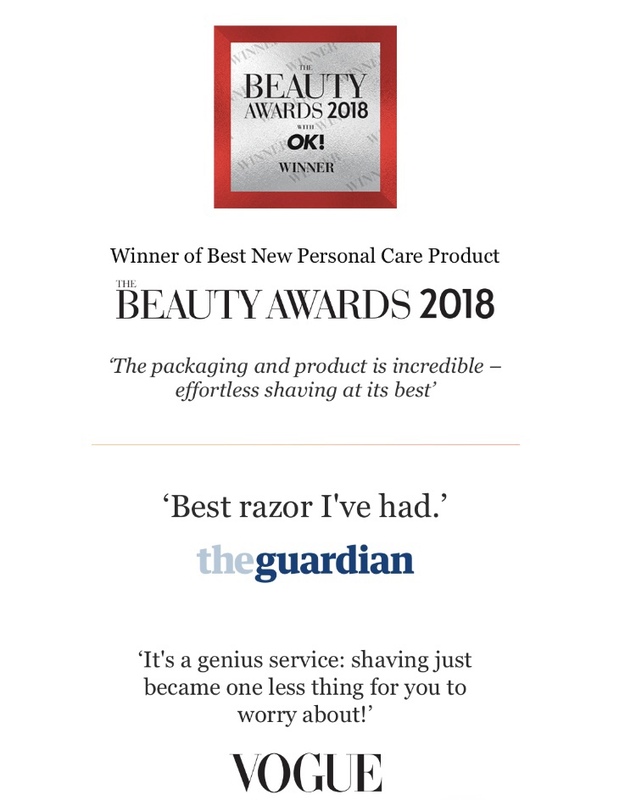 Friction Free Shaving offer a subscription service from around £9 so you can get your fresh blades delivered straight to your door! What could be easier? They work out far cheaper than your high street diamond cut blades too. 4 diamond cut blades, one for every month! 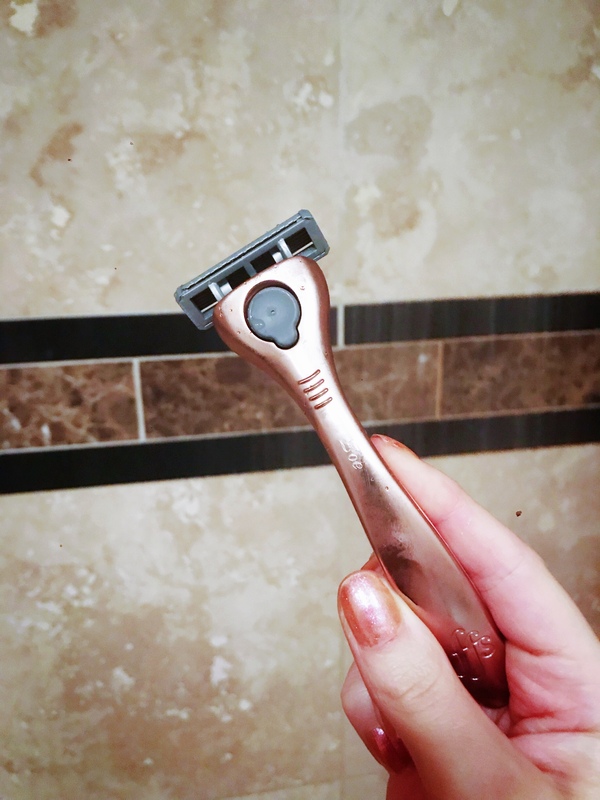 A stunning rose gold razor which can be engraved for an extra personal touch. A razor holder for in the shower. The price for all of this is just £30 and with the link below you can purchase this and get a free pair of rose gold tweezers to tame those unruly brows! Buy here and get a free pair of tweezers! My easy 3 step guide! The pre shave scrub gets to work on your legs removing all of the dead skin cells. This step is essential if you want to avoid patchy fake tan. The pre shave scrub also helps to prevent any ingrown hairs. I buff the scrub all over my legs as soon as I get into the shower. Then there is the shave cream. Paired with the Friction Free razor, this glides over your skin so effortlessly and silky. The cream feels extremely hydrating almost like your skin is having a drink. I cover my legs in the shaving cream after I have washed off the scrub. Whilst my legs are coated in the shaving cream I then shave them and rinse. The after shave balm is a thick nourishing treatment for your legs especially if you are prone to shaving rashes. There is no stinging sensation just a cooling feel from the relaxing balm. The balm smells beautiful and feels so buttery but non greasy on the skin. I apply the balm after my skin have been dried. This box is the perfect gift for every girl. It’s even more perfect to treat yourself. One thing us girls forget to do! Try yours and see for yourself how beautiful it is! Becoming a blogger has been one of the best decisions I have made. I love having a way to express my main passion in life. Parenting. I have noticed a few regular perceptions of mum bloggers where I have admittedly, had a little chuckle to myself. Believe it or not, blogging has made me spend more time with Mole! I love having my free time to play and admire her. I love watching her grow and being able to share our journey with the world. I do my blogging as soon as she goes down for a nap or in the evening after she has gone to bed. Obviously if she is busy playing by herself I will check Instagram but what parent doesn’t nowadays? If I wasn’t blogging I would most likely be back at work as I would have been desperate for something to keep my mind active. There has been times I’ll admit where I have done things so I can capture a photo. For example dressing Mole up in an outfit. But I think I would do that anyway even if I didn’t have a blog? I also feel like I get out more and do more with her. I love sharing what we get up to online. I would still take her to as many activity days as I can so she can look back on her childhood and be happy. I wish haha. I am kindly gifted products in return for a review. Reviews take a lot of work. You can easily spend hours making sure your content is up to scratch to impress the brand. Some companies offer discounts for their products too which is handy. The majority of the time I have paid full price for a product and I will be talking about it because I love it so much and want everyone to try it! No. I think I am talking on behalf of the majority of mum bloggers here. We do not think we are the perfect mum but we definitely try our hardest to be the best mum possible. My life can look very put together through pictures. House will be spotless, makeup flawless and no baby snot on my clothes but that is probably for less than 5 minutes I can assure you. I mainly spend my days in my pjs with a standard mum bun, tripping up over Moles toys left all over the floor. I will also blog about my experience so far with Mole and any advice I can give I will do. This is to help as many people as I can, not to show off that I think I am a mother know it all haha. What myths have you heard? I would love to know! Please comment, like and share 🤩 ! 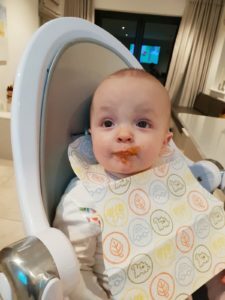 I’m going to confess to 5 mistakes I made when moving on to baby led weaning with Mole. I began weaning Mole at 4 months old after thinking we were both ready, turns out we was not quite ready yet so waited another month. Mole began of smooth puréed foods and loved it! I could feed Mole any flavour and she would eat the whole lot. As mole reached 7 months I began to change up her eating routine to gain techniques with different textures. However, this is when I made some silly and avoidable mistakes. Eating hard foods straight away. Giving up on foods my baby does not like. Not judging the length of time correctly it takes my baby to eat their food. Cutting the food into the wrong shapes. Over facing my baby with too much food. I never took a minute to think that Mole had mainly smooth purée. Moving on to hard food such as cucumber just did not work for her. She had no teeth and found it hard to break down. Mole would just gum the cucumber making no progress or just spit it out and gag. After practicing with soft foods like croquettes and strawberries, Mole felt confident to have a go on harder foods. I also felt like she was enjoying eating and not getting as frustrated. This one is my main mistake. Each time Mole would display signs of not enjoying a food I would give in and never feed her that food again. This also goes for pouches. However, I have now noticed that she changes her mind like the wind. One day she could love a food and the next day she will hate it. I just have to count my luck with her. Knowing this mistake has helped a lot with our baby led weaning journey. I began giving her vegetables as this is the most healthy type of food for her. Mole did not like eating a piece of broccoli compared to eating broccoli purée. I switched it up to giving her fruits knowing that she will eat fruit. And she did. I tried again with her veg and suddenly she was eating it with no issues. I do think that her mood and time of day has a big role to play too. A mistake I made was trying baby led weaning with her right before we had to either go out or be out in a restaurant. I am sure some babies take to this okay but mine did not. If we were out there was always far too much going on for her to even have any interest in picking up her food and eating it. Compared to feeding Mole a purée, baby led weaning takes so much longer. Not my best idea if I had plans afterwards. Obviously you can not rush them to eat so you have to be patient. This was a little frustrating for me when all she would do is throw food on the floor or spit every little bit out. I made sure that when we were doing baby led weaning, we had all the time in the world to eat. It was also nice as I could get a hot cup of coffee whilst she was still eating. I Googled what shapes to cut the food into when I first started baby led weaning. I did this because I was terrified of her choking. Every website I read said cutting into halves or finger sized slices. I think this is one mistake that maybe more unique to Mole. She preferred her food in small bits. Mole seems to hold the food better and put it into her mouth better compared to finger sized foods. Now she is getting more confident I am giving her food in bigger pieces. Looking on Instagram for inspiration I would see beautiful plates full of colourful food. I basically copied not taking into account that Mole had gone from a smooth purée straight to a plate of food would be too much. She would not eat any of the food and try to throw the plate on the floor. I gave up quickly and I became discouraged after seeing so many other babies eat plate fulls of food online. I still display all her food nicely on a plate for photo purposes but when it comes to giving her the food I just take a little bit off the plate and let her eat that. Once she has finished I give her more. I could not believe how much progress she made doing it this way. If your baby is still struggling then they might not be ready. 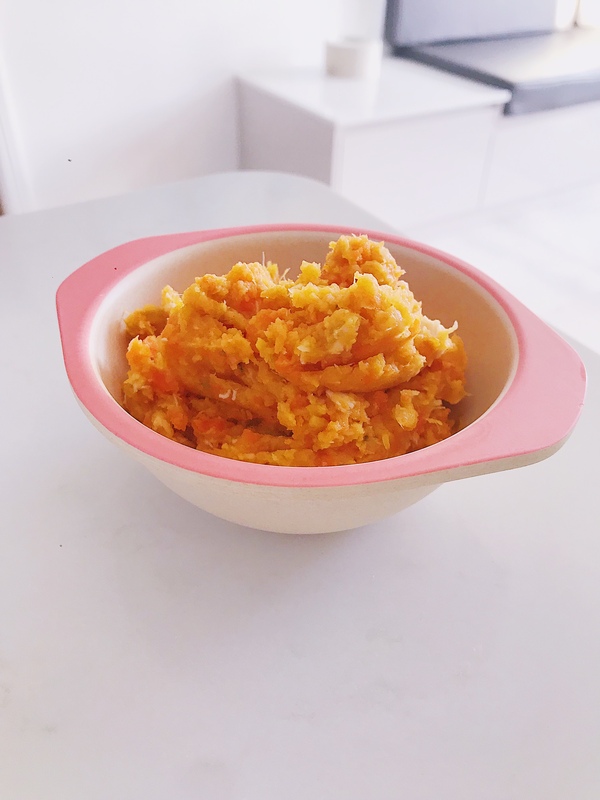 Feed your baby textured purée instead for a bit longer. Get a dog to help clean up the mess haha. How do I get my baby into a nap routine? No Comments on How do I get my baby into a nap routine? As soon as Mole hit three months I began working on her nap routine. I felt like it was important for the both of us. I could get my me time back and Mole would be less grouchy in the evenings. Most three-to six-month-olds will sleep for around 15 hours a day, including regular naps throughout. According to parenting experts your baby ideally needs three sleeps totalling no more than five hours. To get Mole to have three naps a day was well out of our reach. It was hard enough getting her to go down for one let alone three. I focussed on her first nap and what ever else happened was an added bonus. The key to her napping was to notice the signs of when she is tired. At around 9:45am I place her on her play mat if she is not already there and study her. When Mole displays these signs I take her straight up to her cot. It’s a good idea to have a warm bottle prepared too (I usually make this at 9:40am). The key is to take her up as she is displaying the start of these signs e.g. moaning not shouting. As you get use to what you need to look out for the whole process is easier. I can tell within three seconds of looking at her if she needs a nap now. If you wait till they are shouting then you run the risk of them being over tired and getting them to nap in a cot becomes a nightmare. 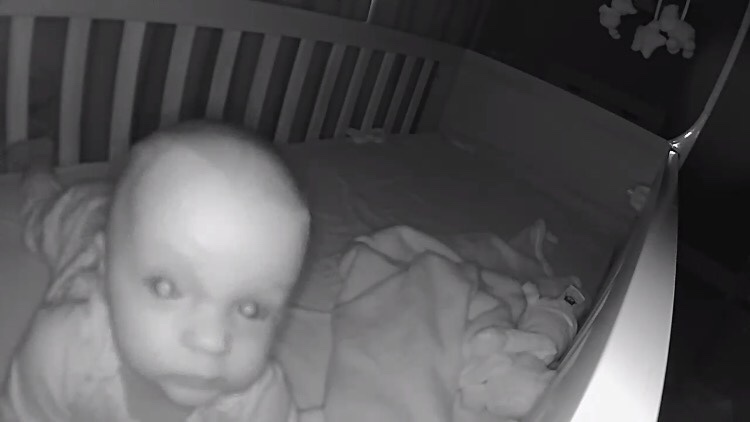 Ensuring their room is dark is a signal to your baby that sleep is needed. I will give Mole her bottle and blanket. The majority of the time she falls straight to sleep after her bottle. Mole’s afternoon nap is a different story. It is much harder to get her down for this nap compared to the morning nap. She does not display the window of tiredness signs as she does in the morning so what I did was work out a time that is best for both of us. 2:00pm. I know that she has had her dinner, nappy change and playtime after dinner. I also know that she is probably ready for her next bottle. I take her to her room and place her in the cot and feed her the bottle. This time she rarely falls asleep on the bottle so I have to give her a kiss and leave the room. 50% of the time she will talk herself to sleep and I love listening through the door at her cute conversation. The other 50% of the time she will cry and scream. I have learnt that if she has had all of her bottle I can leave her for 5-10 minutes and then I go back and check on her. Usually I have to go and distract myself and put the washing in or let the dog outside as hearing her cry upsets me and I give into myself and bring her down stairs. Luckily she ends up falling asleep. 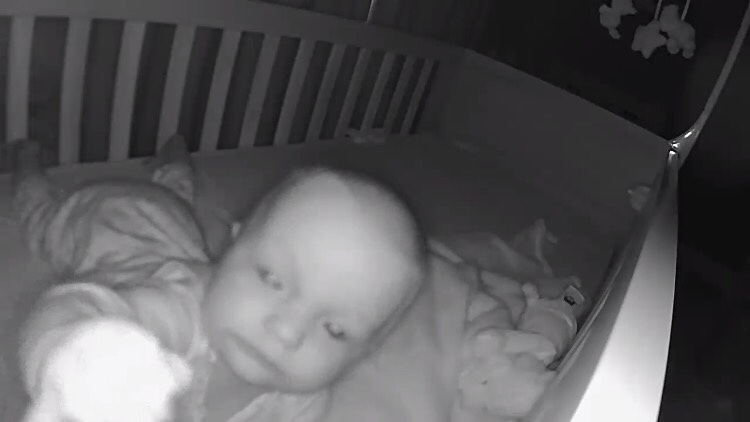 I have the lollipop baby camera so I can check up on her on my phone without going in and disturbing her. If Mole is still awake and not settled then I will check her nappy, offer her more bottle and try again. I never put pressure of myself to make the routine perfect. If the second nap fails I simply take her back down for more playtime and make sure she is in bed for the night at an earlier time. What are good nap times? Good nap times are around the “window of tiredness”. This tends to be 90 minutes after first waking in the morning, 30 minutes to 60 after the lunchtime feed and at 4-5pm in the afternoon. You will work out what times work for you both. Consistency! I stayed in for 2 weeks putting her in her cot at the same time every day. Do not give in straight away. Try to distract yourself whilst they cry and learn to self settle for the first 5 minutes. You don’t have to change them back into their pjs. Make the house as quiet as possible whilst they are trying to sleep. I hope you enjoyed reading! Comment below your nap time tips 😊.